Crocs is a brand that makes quality footwear. Purchase the Crocs items that you need from the retailer you trust the most and you will never go wrong. Get cheap Crocs with great discounts. Plus, choose from the most reliable online retailers such as MandM Direct and eBay. 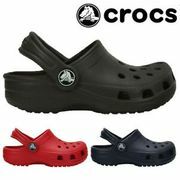 Save as much as 60% on selected Crocs footwear. The Crocs deals here are updated and our community of enthusiastic deal hunters made sure that you can use the voucher codes. There are countless Crocs products to choose from. Cheap Crocs on sale for men, women, and kids! Crocs were founded by Scott Seamans, Lyndon Hanson, and George Boedecker, Jr. They manufactured and distributed a foam clog designed footwear that was acquired from Foam Creations. The footwear was originally made as a boating shoe. The Beach which was the firm model that Crocs made was introduced in 2002 at the Fort Lauderdale Boat Show in Florida. They sold around 200 pairs produced that time and since then they have sold 300 million pairs of shoes and counting. Crocs purchased Foam Creations in June 2004 and their manufacturing operations grew and they have secured the exclusive rights to use proprietary foam resin called Croslite. Croslite is also considered as an injection-molded EVA foam in which the foam forms according to a wearer's feet and offers comfort and medical benefits. Crocs have one patent covering breathable work shoes and methods for its manufacturing. They also have three design patents that were issued in 2006. In 2007, the company registered their Crocs logo as a trademark in over 40 locations worldwide. They also extended their product line to non-footwear products including goggles, sunglasses, watches, luggage, knee pads, and more. There are lots of products to choose from and they are all made from high-quality materials and have gone through thorough inspection. Crocs are very comfortable to wear on a day to day basis and finding cheap Crocs UK mens and womens Crocs sandals across the the country is made easy here at Latest Deals. We have bargain deals from popular UK retailers on this popular footwear including Crocs sandals kids sale, Crocs flip flops, and all other styles. You don’t have to sacrifice your weekly budget to get your hands on the latest Croc clogs or Mammoth Crocs. 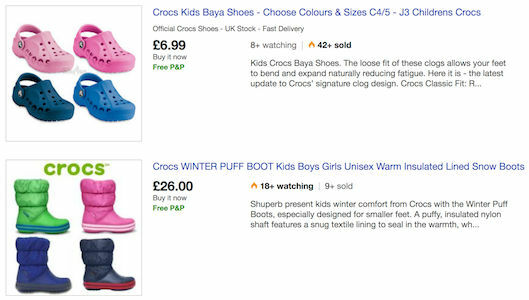 We have a massive community of bargain hunters who regularly share verified Crocs deals, Crocs sale womens, price drops, and discounts from UK online shops. On the other hand, our team of money saving experts will always provide you with essential tips and tricks that will be able to help you save on your instore and online shopping. Just be careful when ordering since these kinds of shoes have different sizes. You should be specific about the size so that you can be sure that it will fit your feet. Nonetheless, You can also have them replaced in case the shoes do not fit. There are lots of styles and colours for you to choose from. Pick the one that will suit your personality and style. There are a lot of amazing deals online to choose from and you will surely get great value for your money. Colourful. You get to choose from more than 20 colours available. They also have various colour combinations. Versatile. You can practically wear Crocs shoes any time of the year. It is comfy to use in the hot and cold months. Crocs also sell fashion accessories. Other than shoes, they also have other products such as watches, sunglasses, and more. Durable. They are made from a very durable material that can last for a long time even if you use it in harsh environments. Can be used as sports shoes. Today, many people are using Crocs shoes for playing various kinds of sports like golf. Classic Clog. For women, they come in various colours including Tropical Teal, Evergreen, Lavender, Pomegranate, Candy Pink, and more. Crocband Clog. They come in various colours including New Mint, Light Grey, Navy, White, Stucco, Cerulean Blue, and more. Specialist II Clog. They come in different colours including Navy, Black, White, and Tropical Teal. Specialist Vent Clog. 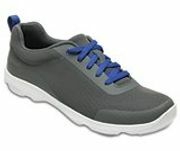 Choose from Black, White, and Navy coloured shoes. LiteRide Clog. It comes in various colour combinations including Pearl and White, Black and White, Slate Grey and Light Grey, Navy and White, Black and Slate Grey, and more. Crocband Flip. They come in plain colours and combinations. Choose from Pepper and White, Black, White, Navy, Ocean, and Electric Blue. Classic Blitzen III Clog. It comes in various colour combinations including Carnation and Oatmeal as well as Pomegranate and Petal Pink. Classic Slipper. This is very basic and it comes in various colour combinations including Espresso and Walnut, Nautical Navy and Oatmeal, Pepper and Oatmeal, and more.